How much does it cost to run a solar pool heater? So many people ask how much it costs to run a solar pool heater. The answer is zero! It costs nothing to operate a solar pool heating system other than the cost of pumping water, which you already do! You do not need a new or additional pump. Your existing pump is normally just fine. 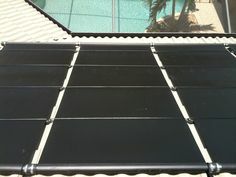 Solar pool heating panels heat water from your pool by circulating water using your existing pump and pool plumbing. We install a “solar loop” that brings water up to the roof from your pump and back down to your pool return jets. Since you need to circulate and filter your pool water anyway, there is no additional cost to operating a solar pool heating system! 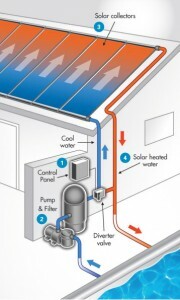 Most people run their pump during the day when solar energy is available to heat water. Timers and electronic controllers can maximize your solar pool heat investment and tell your pump when to run. You can achieve even more savings with a variable speed pump that can increase the pump speed when the solar loop is open! The initial cost of solar pool heating is similar to that of electric or gas heaters, but there is no ongoing electricity or gas operating cost. 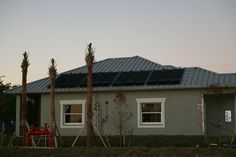 That is the beauty of solar pool heating panels, and the reason that you see them on thousands of Southwest Florida homes. Unfortunately, my company does not normally install panels supplied by others. 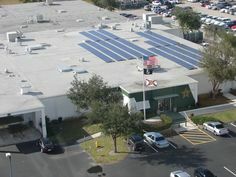 We have found that consumer grade solar panels purchased on the Internet or from others do not perform to the standards needed to ensure customer satisfaction with the heating performance and longevity of FAFCO’s commercial grade panels (sold by authorized dealers only). If you have purchased Sunsaver ST, Sunsaver, or Revolution brand panels, we would be happy to provide a quotation for installation. Let me know what brand you purchased and maybe I can steer you in the right direction.